submission is 18-02-2019. Candidates selection is based on written exam and certificates verification for this Goa DSLR jobs. Exam date, Exam Syllabus is updated in this notification of Goa Directorate of Settlement & Land Records Dept Field Surveyor, Draughtsman LDC posts. 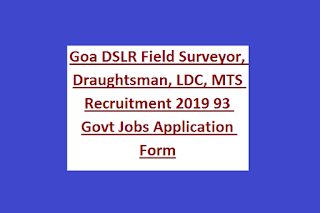 Qualification, post wise vacancies, salary, application form link and other details about this Goa DSLR Field Surveyor, LDC jobs recruitment is updated below. 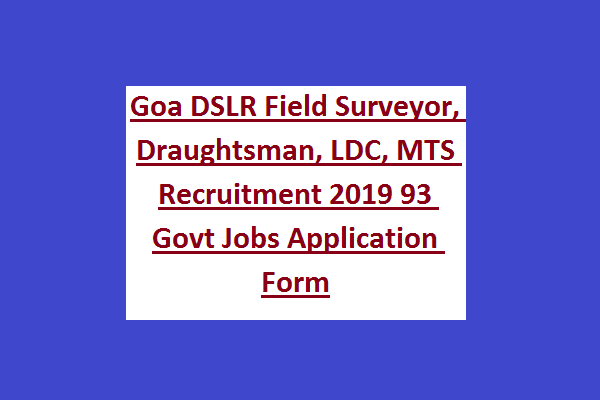 There are total 93 posts are in this Goa Directorate of Settlement & Land Records Dept, recruitment 2019. Upper age limit for General candidates is 45 years. For SC/ST-50 years, and for OBC 43 years. For all the posts candidates will be selected on basis of written exam marks only. Written exam will be conducted for all the posts for 100 marks. Candidates have to submit application form for this Goa Directorate of Settlement & Land Records recruitment on or before 18-02-2019.